Colleen is the owner and one of the trainers at Canine Academy. She graduated from the National K9 School of Dog Trainers and is a certified professional trainer, as well as an accredited Canine Good Citizen instructor, and a Certified Dog Trainer through the IACP. 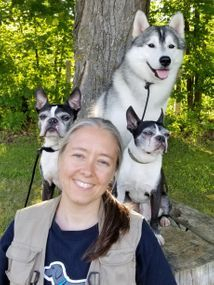 Colleen has attended seminars at Cornell University on Canine Behavior. Colleen is a member of the International Association of Canine Professionals (IACP) and National K9 Dog Trainers Association. Colleen was a 4-H group leader. Colleen owns three pitbulls and 3 border collies. She competes in agility and has competed in obedience. Her dogs have been featured in both Front and Finish as well as Borderlines Magazine. Colleen enjoys fostering dogs, training them, and helping them find their forever homes. Alex has been a trainer at Canine Academy since 2008. She began her career with us after attending basic obedience classes here with her own dog. She was hooked and has never left! Alex owns two German shepherds, Felon and Lukea as well as a black Lab named Kyle. 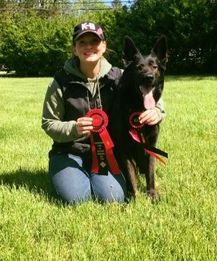 She trains and competes in IPO, AKC obedience and rally, dock diving and UKC conformation. In addition, she raises puppies for Guiding Eyes for the Blind. Alex is a professional member of the International Association of Canine Professionals, an AKC Canine Good Citizen Evaluator, Therapy Dogs International (TDI) Evaluator and also the vice president of Niagara Frontier Working Dog Club (NFWDC). She continues to learn through seminars and workshops and takes classes from other trainers every chance she gets. Gretchen has been with us since 2006. She brings lots of wisdom and enthusiasm to class. She is a TDI evaluator as well as active member of TDI with her dog Tayto. Gretchen owns two boston terriers Poe, and Tayto as well as a Siberian Husky named Kunik. She enjoys training all three in Rally, and AKC Obedience. The boston trio also enjoy doing scent work, agility and trick training. She makes weekly therapy visits with them as well! Gretchen thoroughly enjoys helping people communicate effectively with their canine counterparts. Her dedication and devotion to dogs and their owners is a valued component of our Canine Academy team. 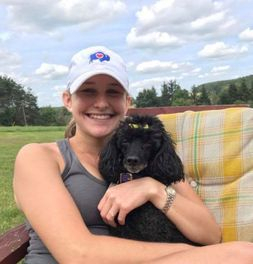 Michelle began at Canine Academy in 2004, working with her miniature poodle Cassie under Colleen’s instruction through the 4H program. Since then, Michelle has competed in obedience, rally obedience, agility and nosework with Cassie. In 2014 she began interning at Canine Academy through Canisuis College. We recognized her skill and devotion to training animals and added her to our team in 2015 after her graduation from the Animal Behavior, Ecology and Conservation program. Michelle is an associate member of the IACP and is also a CGC evaluator. Sue is our wonderful groomer and daycare assistant. 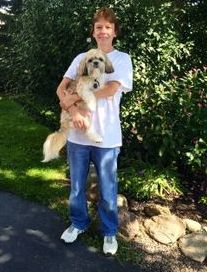 Sue started as a veterinarian assistant at Suburban north and Cheektowaga veterinarian clinics. She owns a mixed breed dog named Bongo who enjoys attending daycare here with us. Sue has been grooming professionally for ten years and does an excellent job with especially nervous, or aggressive dogs. Lisa teaches the beginner and advanced agility classes. Her focus is on teamwork and having fun in agility. Lisa guides you and your dog whether you are there just for fun or if you are going to compete. 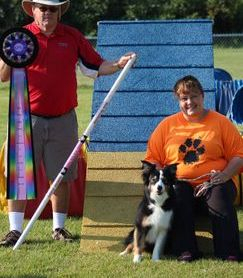 She owns numerous border collies and has multiple titles with her three border collies, Lilly, Echo, and Grace.